Each Beargrass Leather item is hand-stitched using timeless saddle stitching techniques. First, hand-stitching is more durable. 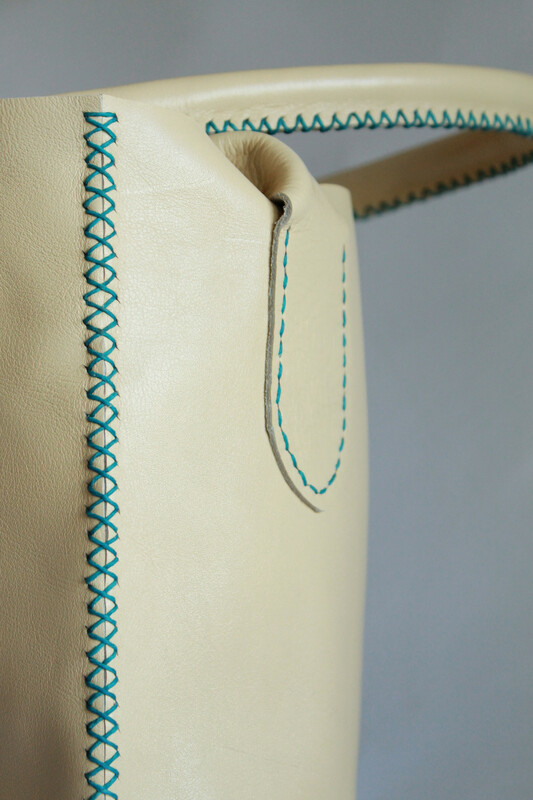 The traditional leather working stitch is called a "saddle-stitch." Saddle makers this very day use a saddle stitch for the world's most durable saddles. Beargrass Leather uses a saddle stitch (or one of its variations). Most often, we use a decorative crossing saddle stitch. Each stitch is actually two stitches, binding against the other in unison. The standard Beargrass Leather thread is made in America and is 100% to 200% larger in diameter than most machine thread. We strive for one continuous thread per stitch run which can result in working with up to 50 feet of thread at a time (such as a gusset or strap). Second, the decorative saddle stitch yields mountains of character. The uniqueness of our cross-stitch ensures that Beargrass Leather products are truly one-of-a-kind, functional pieces of art. Leather lacing is an old-world skill that still possesses a rustic aesthetic. Beargrass Leather enjoys the creativity that lace can add to a leather good. Lace can be braided, woven, tied into decorative bows, or stitched. Decorative bows, if left with long tag ends can be very feminine, yet short tag ends mimic barbed wire -- which can be seen throughout Montana's ranch lands.